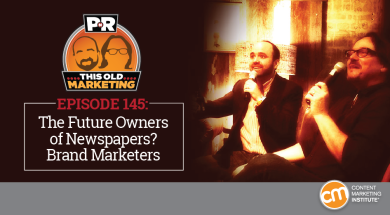 In this episode, Robert and I discuss John Oliver’s take on the broken business model of newspapers and predict the role brands might play in offering a solution. We also share our thoughts on Gartner’s decision to integrate its annual Hype Cycle reports on marketing and advertising and Google’s migration of Hangouts On Air to YouTube Live. Rants and raves include a new view on how to construct the buyer persona, and Facebook’s exciting machine-learning innovation; finally, we wrap up with some well-aligned content efforts from Ernst & Young in our example of the week. Newspapers need solutions, not petty insults (07:05): Recently, John Oliver, host of HBO’s Last Week Tonight, took aim at newspaper journalism and how priorities are shifting from funding credible, investigative reporting to focusing their coverage around click-bait and trend-focused pieces. While the Newspaper Association of America took offense at Oliver’s attack on an industry that’s actively seeking solutions to one of its biggest problems, we find it particularly interesting that newspaper publishers don’t seem to be looking for other revenue streams that go beyond the monetization of content. Gartner zooms out on digital marketing hype (21:43): Gartner’s annual Hype Cycle reports are designed to support marketers’ decisions on where their valuable attention and resources should be directed in the year ahead. However, in a blog post on this year’s data, the research analyst firm explains that it has decided to integrate its formerly separate digital marketing and advertising reports, citing the need for a more complete, single view of the technologies and practices shaping these intertwined industries. Robert and I explain where we see content marketing currently sitting on the spectrum, and why our view differs from Gartner’s. Google plays favorites among its live-streaming services (30:36): VentureBeat reveals that Google has quietly announced it will shut down Google Hangouts On Air as of September 12, and will be asking users to switch over to YouTube Live instead. Though Robert never quite warmed up to the Hangouts experience, due to some significant shortcomings, we discuss why content marketers, in general, should be viewing social media shutdowns like this as an expectation, not an exception. Content Marketing World: Don’t miss the marketing event of the year, taking place September 6-9, 2016 in Cleveland, Ohio. Join brands like LEGO, Bank of America, and Google, as well as other industry thought leaders, as they share insights, advice, and practical tips to help you address even your most complex content marketing challenges. Register to attend, and use code PNR200 to save $200 off the price of registration. Joe’s rave: In a rare Facebook-related rave, I discuss the potential implications of Facebook’s latest innovation, DeepText. According to this Fast Company article, the artificial-intelligence engine can understand the content of thousands of posts per second — and do so “with near-human accuracy.” While the biggest players in this emerging technological field have yet to be determined, as marketers, we should all be paying attention to the potential machine learning has to truly disrupt the online content experience. Robert’s rave: Robert was extremely encouraged by the discussion in this Harvard Business Review article, which asserts that the focus of all the customer data companies are generating should be on creating products and services that customers want to buy. Robert recommends that all content marketers spend some time exploring the “jobs to be done framework,” and look to build their personas around this concept, instead of on the pain points their audience might encounter along their buyer’s journey. After receiving a recent report from Ernst & Young on Global Hospitality Insights, I did a bit of digging and discovered that the company has built dedicated microsites around 14 different business sectors, including automotive, media, government, and hospitality. In each sector, the content leads with what E&Y thought leaders feel will be the key trends in that sector over the next 12 months. Particularly of interest are the calls to action the company includes in these branded initiatives. 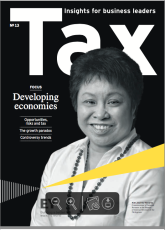 For example, the CTA for the technology sector is a content brand called EY Tax Insights — a fully functional site that regularly dispenses information and advice on the tax issues that growing companies face. Available by subscription in both online and print formats, it’s a great example of how businesses can use thought-leadership content to align their marketing and sales goals.